The Oracles of Fire series continues with this exciting sequel to the Dragons in Our Midst series. Though I reviewed the first book around two years ago, the content of the story was still sufficiently fresh in my head for me to remember that I strongly disliked how many liberties Davis took with the content of the Bible in crafting his story (though I did reread the first book just as a refresher. Let’s examine how this sequel stacks up. The first book in the series, Eye of the Oracle, ends with a whirl-wind chapter which encapsulizes all of the action in the first series (Dragons in our Midst). 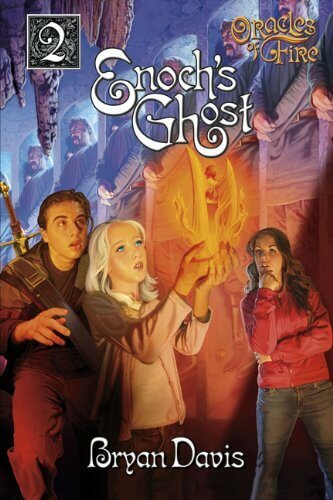 Directly after these events, the second book Enoch’s Ghost begins. Ashley, Walter, Karen, and Thigocia are searching for Gabriel, Thigocia’s son who has not been seen for forty years. Along the way, they find more than they bargain for; such as an entire army of giants hibernating deep underneath the earth, with a strange timer attached to them. They meet a mysterious girl named Sapphira Adi, who tells them the truth behind the giants. Soon, they will awaken, at the command of Mardon, the son of Nimrod the ancient king. Using these giants, Mardon plans to unite heaven, hell, and earth, forever disrupting the cosmos. Yet even he may be just a pawn in a much bigger game. Walter and Ashley plunge in to a whirlwind of adventure and mystery as they rush to thwart the plans of Mardon, aided by Sapphira. Along the way, Elam and Acacia, Sapphira’s friends, find adventure of their own; and Makaidos, the king of the dragons, escapes from Dragon’s Rest and becomes a human spirit. These three stories converge in one vivid moment, when the entire cosmos hangs in the balance. As evidenced by the storyline above (which is much more intricate and well-developed in the book itself), Bryan Davis has no trouble at all coming out with a thrilling page-turner. I, myself, had trouble putting the book down, even taking it to youth group to read with me. But as you can see in my review of the first book (link), I had some problems with Davis’ theological implications. Multiple levels between heaven and hell; dragons turning in to humans; people dieing after they’re dead; heaven being linked with hell – his book trods on some very sacred, yet ill-defined, ground. I think that the reason little has come of this is that the Bible doesn’t tell us much about these areas upon which Davis touches. So, for the most part, he is working with material that we know very little about (part of why his books are so popular). But, like the dragons’ warning sense in his books, I too have a sense of danger in his books, for they seem to take too much of the Bible and change it around to offer their own version of things. The biggest danger, in my opinion, is in his opinions about “Circles.” Throughout these books, we see multiple different dimensions and places where sinners can go, somewhat reminiscent of Dante’s Divine Comedy. Yet the Bible says nothing about anything save Heaven and Hell. Basically, we’re accepting his word for it, and opening our hearts to the idea that these places might be possible. I don’t know – I’m no theologian. I just think that a word of caution is in order before jumping in to these books. My opinion of Enoch’s Ghost is much higher than the first book (Davis managed to keep from changing most biblical events), but I still encourage you to exercise caution. Stay tuned for the upcoming review of the third book in the series, The Last of the Nephilim. This sounds like a brilliant book and series! I may buy it on this review alone. I think you’re over worried about the book’s relation to the bible. It would be a great way to have teenagers and even adults, think about heaven and hell and talk about what it means to them. Heaven and Hell can be difficult concepts and the ideas of them can shape how we view God. So a very important subject to discuss as Christians. I suggest reading C.S.Lewis’ The Great Divorce, which I found fantastic! I found hell a difficult concept to align with a God who IS love, until I read this book. Thanks for your great comment. I definitely do recommend this series and the one that precedes it – Bryan Davis is a very good author. While it’s true that this can encourage people to think about heaven and hell, it’s also slippery ground. We may make conclusions about heaven and hell simply because of what Bryan Davis wrote. The Bible encourages us to be like the Bereans, checking everything with the word to make sure it is true. The big lack of information in the Bible about this topic makes me inclined to be cautious. I definitely agree with you – it is a very important subject to discuss. It’s also important that we stick to what the Bible tells us is true; and don’t drift in to fantasy written by a fallen, human writer (as we all are). The Great Divorce is a fantastic book – I’ve read that as well. C.S. Lewis answered a lot of difficult concepts for me as well. Anyways, I hope this answered some of your objections. Thanks for commenting! Good review, kept nicely neutral. I don’t think I like the first ‘theological implications’ you spoke about either. The first one about dragons turning into humans, (if I assume dragon humans can turn back to dragons) then why can’t humans turn into dragons, or anything else for that matter. I kinda feel this could be fantasy gone too far, as surely this would create a sense of paranoia, as absolutely anyone could be a dragon (a bit like a double-fantasy matrix). The question which I think needs to be asked is ‘where does the pope stand on this book?’. If we go back to Galileo or Copernicus, they were labelled heretics by the catholic church for saying the earth wasn’t at the centre of the universe. Admittedly, the church has moved on now, and the Vatican even jointly runs an astronomy website with the Italian space programme. But this book still treads on thin ice and as you said: ‘ill-defined ground’. The only level I’ve heard of between heaven and hell is purgatory which is where you spend time repenting for your sins. The last point I’d like the pick up on is the different dimensions you can see. If this were true then there would be no point in writing a book about it as it would be impossible to imagine. Although if he did it well enough it probably would be an entertaining read. The question I pose is simply “do you like the book?” as I wasn’t entirely sure by the review where you stood at the end of it. The dragons were given a one-time chance to turn in to humans, to avoid the dragon slayers. They can’t turn back – in a sense, they relinquished their dragon selves (although, in some dimensions they are dragons again, for some reason). You definitely have a very good point – I think that anyone who reads this should check it with someone they know and respect; an authority in their life. The dimensions can be a bit confusing to navigate (there’s Hades, hell, Earth, Second Eden, Heaven, the Bridgelands, and the underworld) but Davis does a pretty good job of writing them. The review does show where I stand – I’m undecided. 🙂 I liked the book, but I’m hesitant to recommend it or the rest of the series without qualms because of these biblical complications (However, the Dragons in our Midst Series, which precedes this one, is VERY good and doesn’t have these problems with it).